Are your files a mess? Do you need to organize your receipts, coupons, paperwork, schoolwork, and more? You want all of them together but separate, and then you say to yourself 'wait, isn't that an oxymoron'? Well now it isn't! 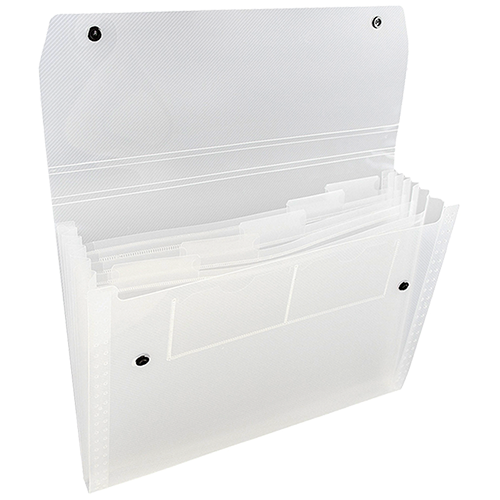 With these folders, equipped with SIX different pockets, all of your papers will be easily accessible, easily separated, and easily organized. Having your office perfectly organized will make your life much easier. With this accordion folder, that expands basically on command, your stress level will diminish. The plastic material will protect all of your documents and the variety of colors will appeal to any eye. You won't ever get behind on paperwork now since everything you need will be in one place! The elastic or snap closure option will also secure all of your papers. Safe and secure papers means never losing, bending, or destroying your files.